An open square which basks daily in the sun’s lasting glow, the Place de la Republique is literally the heart of Arles. With its Romanesque architecture, it still stands with a youthful grace and appeal. The Place de la Republique also known as the Republic Square, lies amidst various other historical charms of Arles. Obelisque d'Arles, a 4th century Roman obelisk, erected right in the centre of the Square. A magnificent fountain, along which you can enjoy a lovely lunch. St. Anne’s Chapel to the left of the square. The infamous cloisters or passageways exhibiting great Roman workmanship. With blue skies as a wonderful background to this historic place, an afternoon at Place de la Republique is enchanting. How popular is Place De La Republique? People normally club together Place Du Forum and Theatre Antique D'arles while planning their visit to Place De La Republique. A nice and beautiful plaza many historical buildings and ancient-looking obelisk at it's center. Classic civic square surrounded on three sides by public institutions, pedestrianised and of modest size it feels welcoming although the facades are large scale and relatively restrained. A focal point during the Rencontres photo expos. 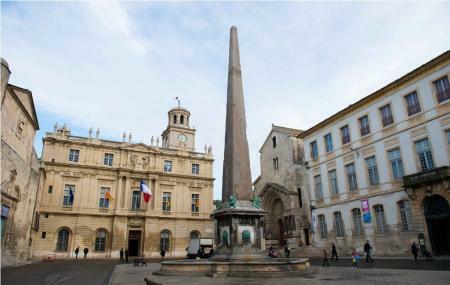 Central City Square, here are some of the main attractions of Arles, but the most impressive is the obelisk taken from the ancient Roman stadium. Now it is in the center of the square. Beautifull town square that gives you the ancient roman vibes the city is known for.